I can’t believe that another week has flown by and we are nearing the end of January 2017. Here’s my menu planner for this week – I hope it gives you some inspiration to feed your family. Sweet chilli chicken stir fry with rice – with lots of veg added in. Yes, there is a slightly naughty meal in there, but sometimes when it’s a grey, cold day you just need comfort food! However, if you make it yourself then you know you have used fresh ingredients, and are limiting the suspicious and unwanted additives. Have a lovely week and please do share and like my post below. I’d also love to hear whether these menus help provide a little inspiration? Hi, here’s my menu planner for this week. I hope this menu list gives you some inspiration for the week ahead. (See my notes below for more information). Lamb steaks, crispy roasted potatoes and a chilli tomato salsa, and green veg. Honey Roast leg of lamb, roast potatoes, vegetables. 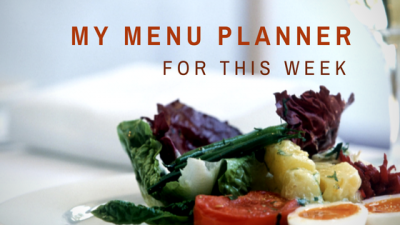 I know for many people the idea of planning your meals for the week seems pretty boring. But, we all have increasingly busy lifestyles, especially if you have kids and I find this really helps. Every week I sit down with a cup of tea and flick through my recipe books/magazines and plan out 6 ideas for meals. I then order all the food online. This stops me being distracted by treats and offers that I don’t need. I also know I have all the right ingredients ready in the house. So, when we get back home from a busy day, I can just crack on with meal preparation. Give it a try – I think you will be surprised how much easier it makes your life and how much money you save – no more buying and wasting food you don’t need and less temptation to buy takeaways because you don’t know what to cook. Let me know what you think of my menu choices in the comments below.